The Blue Fish Bath Alarm simply suckers on the side of the bath or tiles at the desired maximum water level. As your bath fills the unit will emit a loud warbling siren noise when water reaches the Blue Fish Bath Alarm. This is to let you know your bath water is at the selected height. 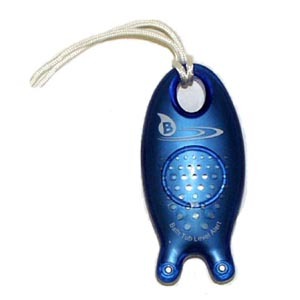 No more waiting around or continually checking to see if the bath is full, the "Blue Fish Bath Alarm" does this for you. It is water resistant, but not designed to be continuously immersed and when not in use you can sucker it on to a tile, so it's out of the way. Children tend to love it and it's a pretty good way to get them up to the bathroom at the end of the day for that ritual bathing session. Please note, one thing it won't do is turn the taps off for you, so you still need to do that part yourself. Replacement set of 3 x Batteries is available as an option. - Optional spare battery pack available.